Girl Scout training, yarn, and cancelling on parties. Daughter stuff. Long and a bit of a downer. I hear the trumpet of angels! I just got a call from the hubby, who says it looks like the drive can still be read! Hallelujiah! So he’s going to back everything up onto multiple DVDs, pick up a hard drive on the way home, and we’ll be back in business soon, knock wood. While we’re at it, we’re going to see how much RAM costs and maybe bump me up there, and hopefully also get a new DVD-ROM, since my old one doesn’t work reliably. It’s a real bummer when I want to put “The Muppets’ Greatest Hits” in iTunes and the drive won’t read the CD. However, the news that photos of my daughter, my Jayne list, Dragonrealms GM notes dating back to ’97, and other assorted irreplaceables are okay has made my day that much better. It’s one of those “you don’t appreciate it until you think you’ve lost it” things. Life lessons you don’t have to learn the hard way are the best. P.S. – in the time it took me to write this post, my daughter neatly took down the curtains in her room and started playing with the curtain rings. Gonna be an interesting day! My hard drive seems to have finally died. Hard. I’m writing this from my husband’s computer. My husband will be taking it in to work tomorrow to see what he can recover. I’m just trying to remember whether I sent a copy of my Jayne kit materials to my mom for safekeeping. I’m pretty sure I did. I know I sent a “pending order” list last week, just in case. My incoming e-mails were stored on the server, which has a redundant backup, all of which is unaffected. And payments came through paypal via gmail, so that’s out there in internet-land as well as on my hard drive. I’m sure I can reconstruct the list if I have to. The hubby’s a wiz with this sort of thing, though, so I’m betting that the crucial stuff can be saved. I’ll have to set up something to get e-mail on a different machine for now. Fortunately, I don’t think it will be that expensive to replace my hard drive. They don’t even make them as small as my current drive anymore, God bless my little lampshade Mac. Wish me luck, both with computer and no school! It’s the weirdest thing. Sometimes I’ll get a sudden geographical cluster of orders. After receiving, say, three orders in a week from the Toronto area, I’ll ask one of the clients if there’s something going on up there. Maybe there’s a meeting, or a showing, or some kind of convention? There never is. It’s just kind of a fluke – as if all of a sudden, for instance, Australia just woke up all Browncoaty. Weird. I’m about to meet the edge of what I’d feel comfortable guaranteeing by Christmas. I like to allow for “hit by a bus” time, in case something happens to me, so I pad in extra time when I’m giving my knitting estimates. I would so much rather have someone pleasantly surprised by getting their hat early than have someone be disappointed for the holidays. Knits up next for NC, NC, and AK. That’s Alaska, not Arkansas, if you’re furrowing your brow over the abbreviation. Really long girl scout post. Eeeeee! Good buddy prostiturtle got a mention on the Craftzine blog for her excellent tutorial on beaded row counters. She even posted up a YouTube video showing how to bend and wrap. Way to go, ! Don’t let the fame go to your head! Knits up next: NC, NC, and NC. I kid you not! We were awakened the other night by an intermittent clanging sound coming from inside the house. Mustering my courage against the threat of monsters, I went to see what it was. This is our fat, lazy, stupid cat. It seems that as she has become less fat, she has also become less lazy. For lo! 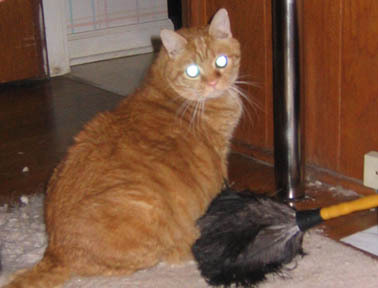 She hath slain the mighty feather duster! The sound we heard was her banging the wooden handle against the metal leg of my husband’s computer desk as she gnawed on the feathery corpse. She’s clawed the rug to bits in that spot to make a little den for herself. 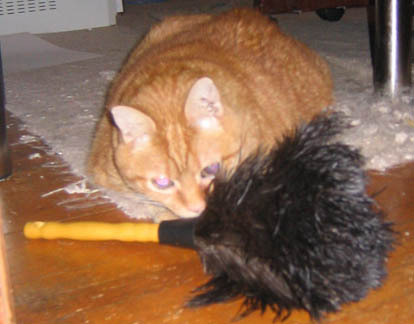 I guess she brought the duster back to her lair to beat it into submission. Now she carries her trophy around the house, meowing loudly and rhythmically out of the sides of her mouth. She sounds like a car alarm. Well, maybe the mental exercise will make her less stupid, too. We can only hope. Note to self: keep an eye on this “Gino” boy. Hats up next for Illinois, Utah, and Tennessee.